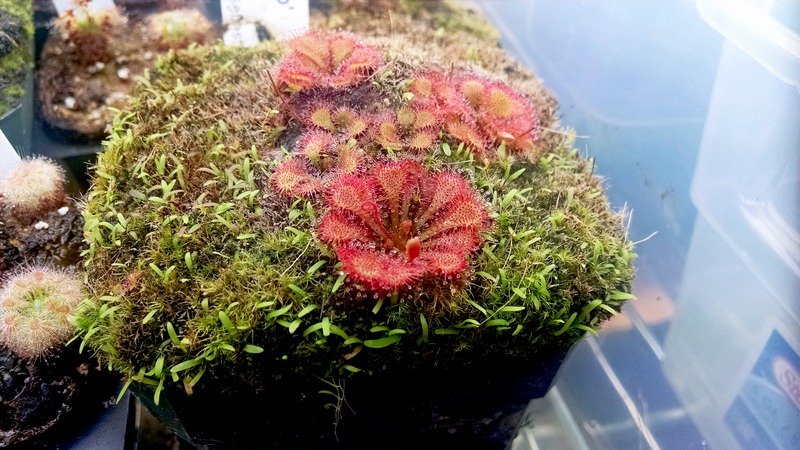 Sometimes I feel like posting about my sundews but lack a good unifying theme for the post. This is one of those times. There are actually 3 flower stalks in my Drosera madagascariensis pot. I've had to add some more straws into the pot for support. I guess the D. madagascariensis are doing pretty well. It's a little hard to see (click the picture for higher resolution), but there's a flower stalk silhouetted against the label on the left, and also one against the yellow straw (and of course the tall one up top). It's gonna be pretty touch-and-go for a while until these are done blooming, but then think of all the seed! 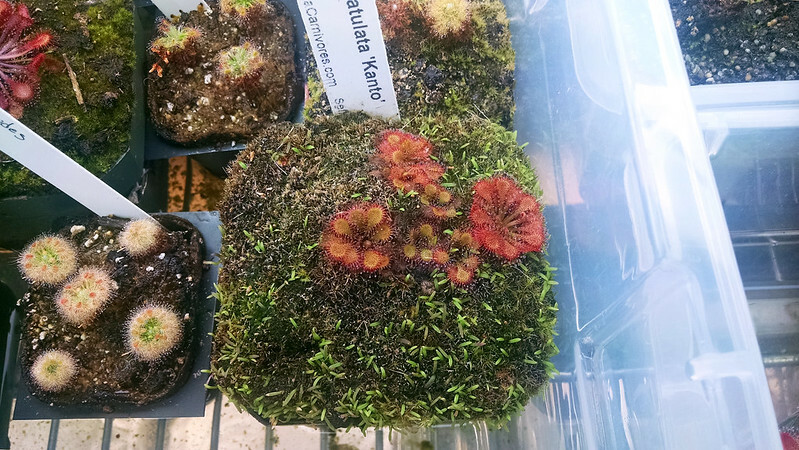 A few weeks ago I took a trip up to California Carnivores and picked up a pot of Drosera spatulata 'Kanto'. 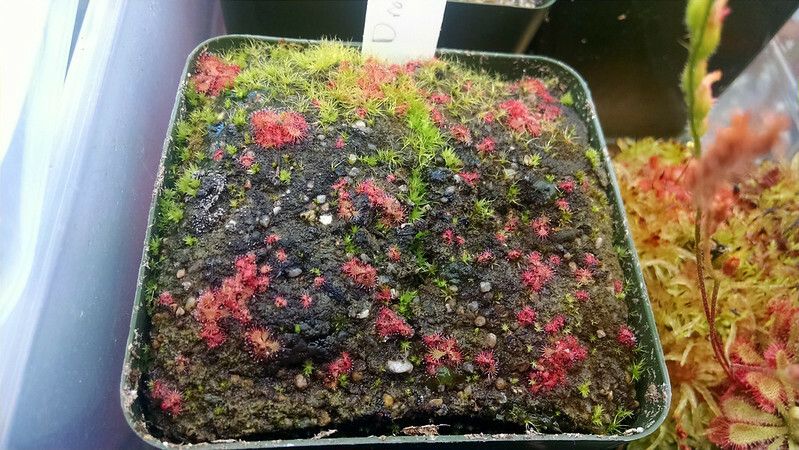 The moss in this pot is really deep and turf-like. It has acclimated to my conditions really well, and is coloring up nicely, in addition to getting some good dew production. Also, it's begun to flower! The flower stalk is hard to see cause it's thin and the same color as the plant. It has happened several times that I've acquired plants and had them begin to flower within a couple weeks of entering my collection. I think it has to do with all the light I provide, but maybe I'm just flattering myself. There's some more weirdness over in my Drosera filiformis pot. There's a little offset forming off the base of the (hopefully) dormant plant. I've stopped trying to figure out what these plants are up to. I think I'm just going to ignore them and hope for the best. My Drosera natalensis seedlings are finally putting on some size after having been fed a couple times. Things are filling out around here. Also, the larger seedlings are well-spaced throughout the pot, which is nice, since they won't be all crammed together like some other seeds I've started have been. If I had more time and was better about feeding these guys regularly I bet they'd start exploding about now. I should really feed my collection again. Finally, here are a few Drosera aliciae seedlings. 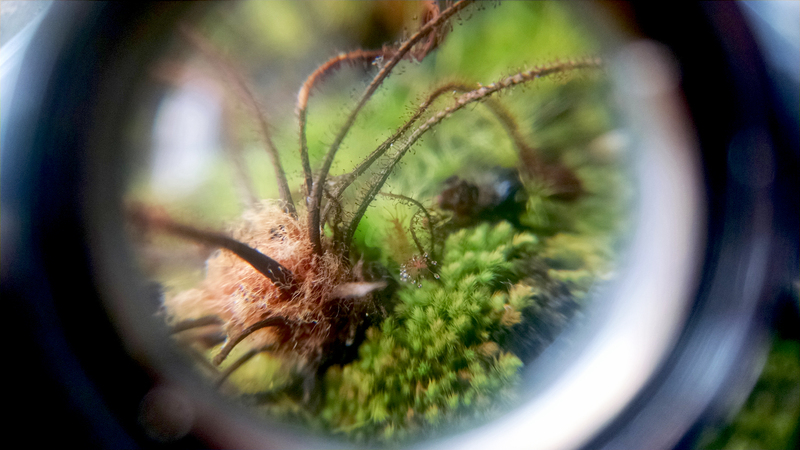 The moss has a head start but I bet the sundews will take over soon enough. I scattered seeds on this pot when I decided I didn't want to bother packetizing the rest. It was never covered, and just sat out in the tray. I think they took a bit longer to germinate than other seeds I've done, but here we are! I should start feeding these guys. Anyway, that's what's going on in my collection. What's up in yours? I have about 10 plucked from the wall at work the size of a 20 cent piece. I have been feeding my little ones spiders and moths. They have no problem sticking to the mucilage with thigmonasty slowly taking place over the few hours. I haven't seen the plant consume an entire bug yet but im sure I will. You have a great collection, im planning on making mine bigger over time. Keep these posts coming, I'm enjoying learning about these. Also how do you extract the seeds for the sundew? I'm glad you're learning! 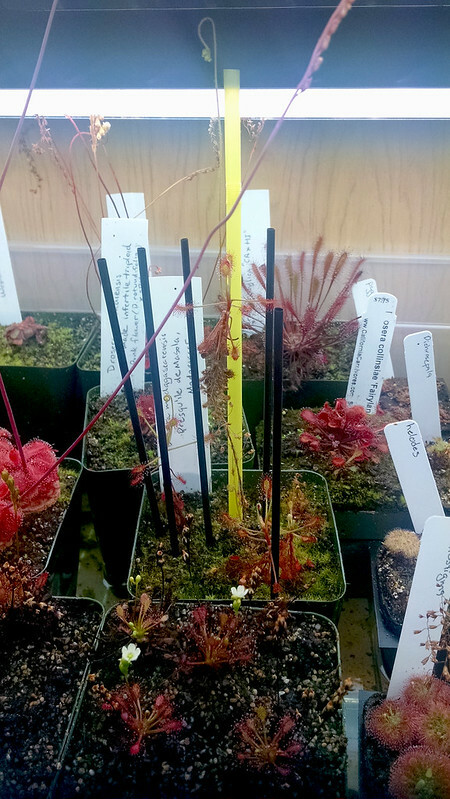 Sundews won't consume 100% percent of the bug...generally the exoskeleton will remain. I feed my plants beta fish food (check the Blog Series page for details), which is generally digested in its entirety. 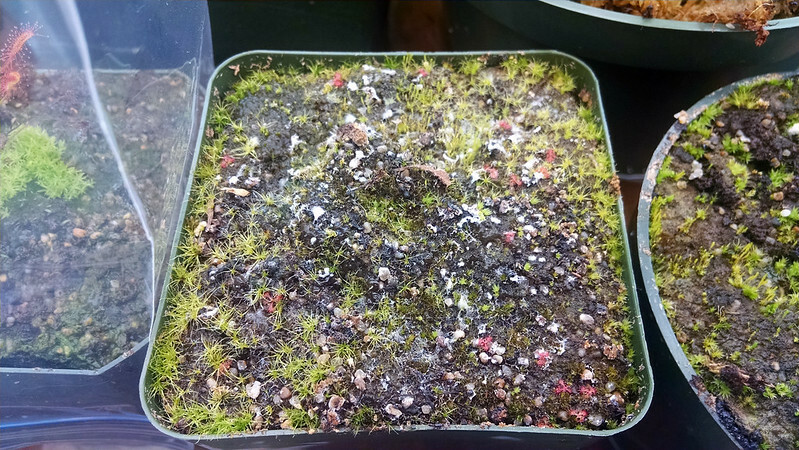 Harvesting sundew seeds is quite easy. Once they are ripe and getting dry, simply clip off the stem and tap it onto a sheet of paper. Lots of species will just have seeds pouring out. Some, like D. intermedia 'Cuba', need you to apply a bit of pressure on the pods to get them to pop out. Again, there's more detail on my Blog Series page, and also on www.grow sundews.com (which is my #1 resource for sundew cultivation information). If you have more questions feel free to email me at sundews.etc@gmail.com. Hey, do you have archives of your set up?? There are a few posts under the label "grow spaces" (http://www.sundews-etc.com/search/label/grow%20spaces) which give a sense of what I'm working with. I could afford to do another summary post though. that link was very satisfying thank you ! !